Friday was Amy‘s birthday. I probably shouldn’t share which birthday. For her birthday, we went to London for the weekend, doing touristy things like the London Eye and shopping stuff like Selfridges and Liberty. For her birthday meal, I thought of trying something a bit different and booked us a table at Dans Le Noir. It’s an unusual restaurant, so I thought it was worth sharing a little about the experience. I know I tend to ramble, so let me get a short version out of the way: you have to eat in the dark, and it’s pretty intense. Yesterday was Over The Air 2010 – a very cool event for mobile developers, that really warrants a post to itself, but I’m too tired so that will have to wait for another day. But while I was there, I had a go at the hack challenge. I’m pleased that there was a fair amount of interest in what I did, so in this post, I want to share some of the technical details. The hack centred around getting access to (pseudo-)realtime data about UK roads. It turns out that there is an effort to make traffic and road monitoring data available in a consistent, interchangeable format: DATEX II. 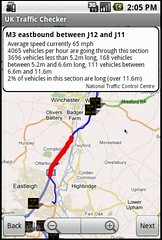 I only had 24 hours to play, so started with the data available for England – covering the motorway and trunk roads. The web page includes a 39-page PDF which documents the data that the National Traffic Control Centre publishes for England. The nice thing about DATEX II being an agreed standard is that although I spent the evening working with the English traffic data, once the code was done, there wouldn’t be anything to stop me using the same code with the Scottish data too. They publish a lot of data – more than I realised was being collected, let alone made publicly available. This chimed well with the keynote on Saturday morning by the brilliant Tim Berners-Lee, in which he talked about the importance of publicly available data. But beyond the list, what was impressive was the amount of detail. For roadworks, you can find out not only where they are, but what type of roadworks they are – e.g. resurfacing, barrier repairs, bridge repairs, etc., what times of day they will be active, when they are expected to finish, the anticipated level of disruption, number of lanes to be closed, and much more. For events, you can find out the type of event (e.g. if it’s a sports event what type of sport, if it’s an entertainment event what type of entertainment – e.g. boat show), as well as details about times, expected level of disruption, and so on. For unplanned events, there are codes for a variety of types of events e.g. Spillages are divided into types like chemical, oil, and – unusually – “shed load”. Accidents are categorised into serious, multi-vehicle, vehicle fire, vehicle recovery, overturned vehicle, and so on. Other event codes include animals on road, people on road, obstructions, severe weather like fog, rain, snow, ice, high winds, etc. And loads more. And again, you get all the detail about times, level of disruption and so on. For the variable message signs, you get the message text itself, the location of the sign, the source of the message (which authority set it), and so on. For the matrix signs, you get the code for the icon being displayed, the location of the sign, the time the message was set, etc. Not only was it detailed, but it was up-to-date. Data is updated at two-minute intervals if you pay for a premier account, or ten minute interals for the free standard account. This was awesome. So much information!